I’m the kind of person who keeps New Year resolutions. Not that anyone wants to hear about it much past the end of January. It’s a quiet self-discipline. But I decided some time ago that if I couldn’t keep promises to myself, why should anyone – friends, partners, clients – believe that I could keep my promises to them? Most of my resolutions – probably in common with yours if you make them (and if you don’t you probably wouldn’t be reading this post) – are about self-improvement. Inching my way bit by bit towards becoming the person I aim to be. I seem to remember that the first time I made resolutions and knew that I was going to keep them, I kept the number down to two or three. Those days are gone. This year I will barely restrain the list to below ten. Some are easy. Don’t eat this. Don’t do that. Whatever your desired bad habits are, it’s simply a matter of discipline (unless there’s actually some kind of physical addiction thing going on). And discipline is like a muscle. Exercise it regularly, it gets stronger. But some are a bigger commitment. These are usually the ones that will take time and determination to do. For instance, I’m ramping up my physical activity in 2017 from the two-to-three sessions of tennis per week to get back into strength training and cardio, and to take up something new for me – immersive swimming. For me, swimming was always a splash-about kind of thing. Now I want to learn how to swim efficiently and well and to make it a regular habit. You only fail in your resolution if you fail to install the habit. I’ve defined how many times per week I do each activity, with a variation for weeks where I have foreign travel (including a plan for when I’m staying in a hotel with a gym and/or a pool, and a different plan when I’m in a hotel without). Variations can kill your resolutions if you don’t plan for them. Here’s a few of the things that I believe help me to keep resolutions. State of mind. Many people go into their New Year resolutions anticipating failure. It’s part of the narrative they tell themselves from the start. They wonder how long they can last – and the expectation of ultimate failure is built into that question. Instead, you have to go at it with the basic assumption that failure is just not acceptable. Full stop. Sometimes, it helps to build in permissible variations. Last year, I gave up watching TV because I wanted to reclaim the time it was taking. I stated that I would make an exception should Andy Murray make the final of a grand slam tournament (which he did three times out of four) and I added the world tour finals where he sealed his end-of-year number 1 slot. Sometimes when I told people about that, they became dismissive and described it as ‘cheating’. That is the weirdest thing ever. Don’t waste time listening to people who don’t even try to keep resolutions about what does or doesn’t count. You’re not doing it for their approval, you’re doing it to shape a new personal habit. Sometimes it helps to build in an end date that comes before the end of the year, either with the option to renew, or simply because you would find it harder to keep the resolution if it meant never ever experiencing the thing ever again. So a few years ago I gave up chocolate for the year, but decided from the beginning that would expire a week before Christmas. Obviously, Christmas is the time when chocolate is part of the experience (and one of the things I often get as a gift). And it meant that I could consider then renewing the pledge for the following year knowing that I still got to have that one window. Interestingly, by the time I got to Christmas, I was relatively uninterested in jumping into a chocolate-starved binge fest. I was just out of the habit. But knowing it was there as a possibility certainly helped earlier in the process. Go for measurable resolutions. Generally exhortations to ‘get more fit’, ‘exercise more’, ‘eat less bad foods’ and so on are a waste of time. Work out what you need to do and how often, and set yourself that target. Have a system for accountability. If the disciplined state of mind described in point 1 above isn’t enough for you, then getting someone else to hold you accountable is an option. This year I’m trying out the ‘coach.me’ app. 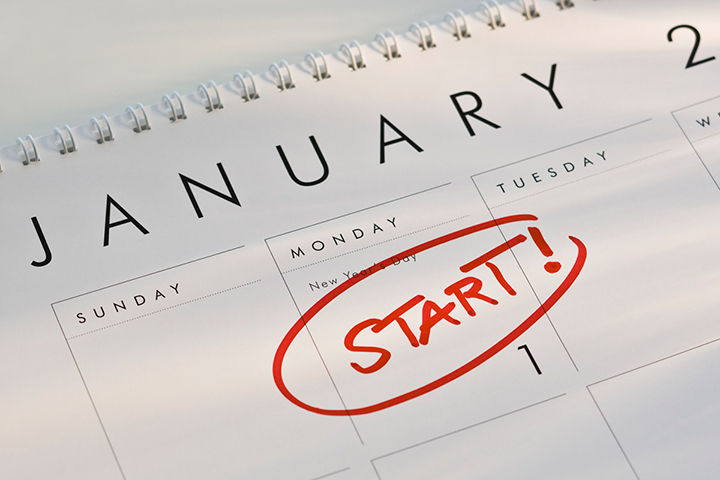 You can programme your resolutions into it, tell it how often you expect to do something, and then record when you do it. If you need more than an automated process, you can hire remote coaches – human beings who will help you deliver on your promises. I’m not expecting to need it, but since I’m going for quite a few resolutions this year, I thought I might find it useful to give myself a daily reminder of the things I’m committed to. Anticipating obstacles is also part of it after all. Make it part of your identity. Identity is the most powerful thing we have. Did you notice how I started this blog post? “I’m the kind of person who keeps New Year resolutions.” Frame your identity the way you want it to be. Become that person. If you’re stuck for what sort of thing you might want to promise yourself, try the following framework – see if you come up with some ideas. One bad habit that, if you stop it will give you better health or more time. One last observation. So far, I haven’t broken resolutions once I’ve established them. But it seems to me to be a mistake if you treat breaking a resolution akin to losing your virginity – ie. Once it’s gone, it’s gone. Broke your commitment not to eat chocolate? Damn. Well, might as well binge out then. No! That’s entirely an attitude thing. Plan not to fail (see point 1), but if something happens to interrupt your smooth progress, treat it as a temporary glitch, not the end. Respond to the glitch – maybe ramp up the accountability in recognition that you need to improve the odds for next time. But unless your resolution actually was to keep your virginity, then you can always get back on track. Andy Murray lost many matches before becoming the world number 1. Each loss was an opportunity to learn and adapt, not an excuse to give up. The point of the resolution is installing a new habit, and the recognition that a moment in time that naturally feels like ‘a new chapter’ is a good time to do it (birthdays are good too). You only fail in your resolution if you fail to install the habit. Whether it was one seamless process, or whether it was a case of triumph over adversity is irrelevant. So what’s your success rate with these sorts of promises? And what plans have you got for 2017? I’d be interested to hear them!